There are only five states in the country with no sales tax. So when a jewelry store can boast a selection of over 75 jewelry designers, a watch and gift boutique of over 30 brands, an in-house design, and manufacturing shop and be TAX-FREE… What a gem! A.R. Morris Jewelers of Delaware can boast about all of these things and have been for over 50 years. All while providing each of their customers the personal attention needed while making the important decision of buying an engagement ring. For their heritage of trust, integrity, quality, and value, Coast Diamond is pleased to call A.R. Morris Jewelers of Delaware our Retailer of the Week. 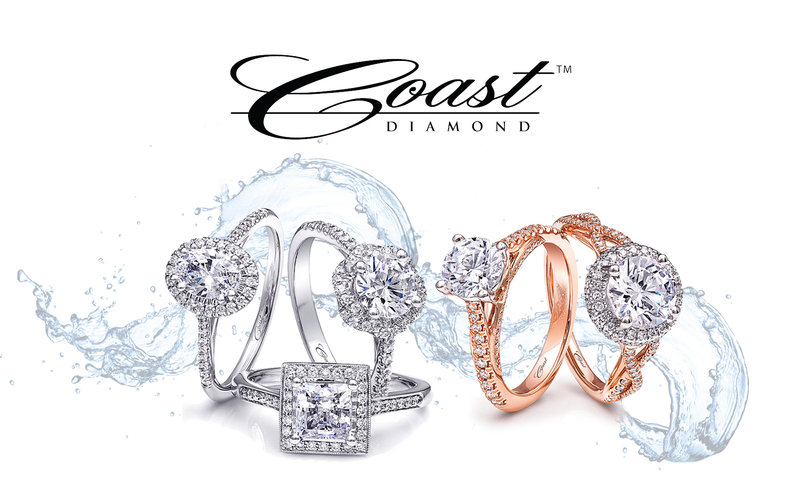 Follow Coast Diamond on Facebook by clicking on the gorgeous stack of Coast Diamond rings above. Let’s talk stacking diamonds… and rubies, since it’s July. A dream bridal stack starts with a gorgeous centerpiece, the engagement ring. While a stack of diamonds is breathtaking with any style of engagement ring, a pretty spectacular start is the traditional six-prong solitaire engagement ring. Coast Diamond six-prong solitaire engagement ring (LC5386) with petite prong set diamonds on the band. Start the stack with the matching wedding band (WC5386) of petite prong set diamonds. Click image for details. This Coast Diamond 1CT round diamond engagement ring (LC5244) with a six-prong setting and diamonds cascading down the shoulders of the ring has a matching wedding band (WC5244) that is the perfect start of your bridal stack. Click image for details. How to create your dream stack of diamonds? There really are no rules. Do what you love. But if July is your birth month or you just love rubies, like we do, add this stunning diamond and ruby eternity band. The Coast diamond and ruby eternity band (WC20020C-R) features fishtail set diamonds accented with rubies. Click image for details. Your stack doesn’t have to end there. Coast Diamond has countless bands to choose from to create a dream stack of diamonds. Not just for bridal, our fashion bands are a perfect gift for birthdays and anniversaries. Congratulations to A.R. Morris Jewelers for being our Coast Diamond Retailer of the Week! Fashion forward engagement rings are increasingly popular with couples these days! Trends include floral motifs, the use of yellow or rose gold, unique cuts such as rose cut or square with a braided band. Regardless of which style you prefer, Coast is sure to have what you’re searching for, especially for the modern bride-to-be! In 2000 Bob and Theresa Capace opened the doors of Worthington Jewelers in Worthington, OH to share their passion for celebrating one another and the bonds of family with others. Raising a family of five they understand budgeting and strive to provide “more bang for your buck” at Worthington’s. They also understand it is important to be comfortable in a jewelry store, so at Worthington’s they have created a relaxing, pressure-free environment. An environment where you can learn all about diamonds and engagement ring settings and they can help you create the one-of-a-kind engagement ring of your dreams. For their ability to combine all these aspects and bring them into your engagement ring shopping experience, Coast Diamond is excited to call Worthington Jewelers of Worthington, OH our Retailer of the Week. A solitaire engagement ring can stand on its own, but the band of the ring can make it unique. The set of the diamonds on the band – the size of the diamonds on the band – the size of the center stone paired with the diamonds on the band can each create a completely unique look. This Coast Diamond 2CT solitaire engagement ring (LC10020) is accented with a petite band of 0.15CT diamonds. With the petite diamond band a 2CT center stone becomes the eye-catcher in this solitaire ring setting. A Coast Diamond ring can be set with a variety of diamond or gemstone center stone shapes. The staff at Worthington’s has some great advice on choosing the perfect center stone for your engagement ring. The Coast Diamond 1CT solitaire engagement ring (LS10005) is accented with 0.35CT of fishtail set diamonds on the band. The entire ring is the statement, because of the substantial band of diamonds cascading from the 1CT center stone. Bonus Tip: To finish it perfectly on trend… choose a square (princess) or rose cut diamond center stone. Get truly creative and mix metals on your dream engagement ring. This Coast Diamond award-winning halo engagement ring (LC5410RG) is a beautiful mix of white and rose gold. White gold around the crown of the setting brings sparkle to new heights and rose gold creates a warm glow on the finger. Any Coast Diamond ring can be customized with mixed metals. The engagement ring experts at Worthington’s will help you mix the perfect blend of metals to create your engagement ring. Congratulations to Worthington Jewelers of Ohio for being our Coast Diamond Retailer of the Week! Each week Coast Diamond enjoys celebrating a Retailer of the Week that best represents the hallmarks of Coast Diamond – elegant design and superb quality – with a commitment to excellence and customer satisfaction. Since 1935, Galloway & Moseley Fine Jewelers of South Carolina have been doing just that. Their friendly staff make it fun to find your perfect engagement ring setting and easy to complete it with a gorgeous center stone of your choosing. For being “so caring about delivering a special memory” to each and every customer who shops with them, we are thrilled to call Galloway & Moseley Fine Jewelers our Coast Diamond Retailer of the Week. The trends of engagement ring style are set by the most influential in bridal. The “most influential in bridal” is YOU. What do you desire in an engagement ring setting? What kind of center stone are you choosing to complete your setting? There are two trends emerging, because you are asking for them: the oval shaped center stone and the hand engraved engagement ring setting. The oval is becoming a highly sought after shape of center stone to complete an engagement ring setting. From the Charisma Collection the Coast Diamond 1CT oval halo engagement ring (LC10233) is regal and slimming on the finger. With a nod to true vintage style, the hand engraved engagement ring setting is taking its place in engagement ring trends. The beautiful detail of hand engraving is enhanced by two rows of fine pavé set diamonds in the Coast Diamond 1CT hand engraved engagement ring (LC6068) from the Vintage Collection. A beautiful blend of modern and vintage the Coast Diamond 3/4CT halo engagement ring (LC6081) with hand engraved band is truly charming. Every setting in our Coast Diamond Vintage Collection is exquisitely hand engraved in platinum. Galloway & Moseley Fine Jewelers looks forward to learning how you influence the trends in engagement ring style. Stop into one of their two South Carolina locations (Sumter and Florence) where they can share the entire Coast Diamond Designer Engagement Ring Collection with you. Congratulations to Galloway & Moseley Fine Jewelers of South Carolina for being our Coast Diamond Retailer of the Week! Shopping for an engagement ring is the first celebration of a lifetime of love. To see and feel the beauty of the diamond engagement ring that will represent that love is a special time and it’s a time when good old-fashioned customer service is very important. Ingram’s Fine Jewelers of Idaho Falls, ID has set themselves apart for almost 50 years with their good old-fashioned customer service. It is honest and friendly service, with great prices and high-quality jewelry, that has brought generation after generation of Idahoans back to their showroom. In appreciation of their dedication to good old-fashioned customer service, Ingram’s Fine Jewelers is our Coast Diamond Retailer of the week. At Ingram’s Fine Jewelers you will find our most celebrated Coast Diamond engagement ring. It is the petite halo engagement ring (LC5410) that has endless possibilities for customization. Your choice of metals and the size and shape of the center stone create the perfect engagement ring to represent your lifetime of love. The Coast Diamond rose gold cushion shaped halo engagement ring (LC5410-RG) was the highlight of Engagement 101’s Wedding Set of the Year in 2015. The engagement ring is crowned with a center stone and halo set in white gold. The matching rose gold wedding band (WC5410-RG) adds extra sparkle to this award-winning set. The celebrated Coast Diamond petite halo engagement ring is customized with an oval center stone (LC5410-OV) below. Set in platinum, this ring is a timeless representation of your love. The pear or teardrop shaped center stone (LC5410-PRS) is a truly unique take on our celebrated Coast Diamond petite halo engagement ring. It is a stunning and graceful engagement ring with a bit of attitude. How would you personalize the most celebrated Coast Diamond engagement ring at Ingram’s Fine Jewelers? Let us know in the comments below. Then visit the Ingram’s Fine Jewelers’ showroom in Idaho Falls to make it happen. Thank you Ingram’s Fine Jewelers, of Idaho Falls, ID, for being a Coast authorized retailer who values good old-fashioned customer service. We celebrate you as our Coast Diamond Retailer of the Week!